The BT 3440 is one of BT's latest range of phones that have the One Touch Do Not Disturb button, with a simple touch of the button you can send the call directly to the answering machine. The BT 3440 features some of the best Nuisance Call Blocking technology. This amazing technology offers users excelent control over which calls they want to allow. You can are able to block a list individual numbers. Additionally you are able to block calls by their type. Examples include witheld or international So long as you add your contacts to your phone, they can bypass the call blocking, so you don't miss them all important calls from friends or relatives. The BT 3440 is one of BT's latest range of phones that have the One Touch Call Block button, with a simple touch of the button you can send the call directly to the answering machine. 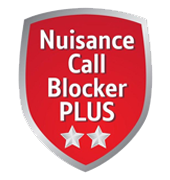 If you have already answer the call and its one of those nuisance calls then again just press the button and that number will be added to your list of blocked numbers and the call will be ended. The BT3440 has a nice large 1.6" graphic display that is easy to read and will show you missed calls, voice messages and any text messages you have received. This phone has a visual voicemail so you can see who's called you and even choice which message to listen to first, and with 15 minutes of recording time you have ample room for messages. You can save up to 50 name and numbers in the phonebook memory and these contacts are automatically copied over to all addition handsets so you will always have the numbers to hand on any handset you use.